Become a Working For Kids Coach. A four-part training program has been developed to teach those who work with young children about how the brain develops and how strong brain development can be fostered effectively through fun and engaging activities---setting children on a lifelong trajectory of success. The sessions are designed to last about an hour and a half each. In many cases it is helpful to follow up these training sessions with specialized training sessions on specific topics, that can focus on how a particular community will put a program in place that helps foster the brain development of children in that community. This training program can also be scheduled as a one day, 6 hour training session, three 2-hour training sessions, or two 3-hour training sessions. All participants who complete the training sessions receive a certificate showing they are a Working For Kids Coach. If you are part of an organization where people would like to become a Working For Kids Coaches, please contact us at workingforkids@pitt.edu to inquire about scheduling training sessions for your group. If your organization is in the Pittsburgh region we will generally bring the training to your location. If your organization is outside of Pittsburgh arrangements can be made for a Working For Kids trainer to visit to run a training program. Training Session 1: How Experiences Shape Brain Development? This training session describes of how brain pathways form during development to support all the skills a child will gain as they grow up and learn. For each skill a child learns (focusing attention, understanding emotions, language skills, problem-solving skills) a network of brain circuits develop that allow them to do the skill well. These pathways form in the brain from birth until about 25 years of age, with each pathway forming at a specific age. You can learn new things later in life, of course, but you use the pathways you already have, you don’t develop new brain pathways. In this session we will discuss when various brain pathways develop, and how to help children develop the strongest brain pathways possible. Helping children build strong brain circuits is fun, rewarding and sets children on a positive road to succeed in school and in life! Supportive environments, with adults who are caring, offer support, and encourage children to develop new skills are critical for healthy brain development. In such environments the cycle of learning, that involves a child becoming interested in developing a new skill, engages them in activities that allow skill development, and allows them to gain self-confidence in performing that skill, is supported and encouraged. A key to effective skill learning is to individualize the strategies to the child so that they become deeply engaged in skill development. This session will focus on how to create supportive environments and how to work with children to encourage their participation in the learning cycle. Such environments not only play a strong role in brain development but also serve to buffer children from the negative consequences of adverse childhood experiences when they occur. In this training session participants will play The Brain Architecture Game (www.thebrainarchitecturegame.com; also see the RESOURCES page of the Working for Kids: Building Skills™ website) --- a fun, interactive game where groups of players build a brain and see if it will be able to grow tall and strong and survive life stresses. You will learn the amazing power of life experiences in shaping brain development, as well as learn how caring adults and older children interacting with children are critical to the development of strong brain pathways and preventing long-term negative impacts of adverse childhood experiences on brain development and long-term health. How you interact with children matters. Interactions where adults listen to what a child is interested in and help them make the best use of their interests are particularly effective in promoting the development of strong brain pathways. The first part of this session focuses on ways of interacting with children to maximize their skill development. What activities will help children build strong brain pathways for the skills they need to succeed in life (focusing attention, communication skills, language skills, problem-solving skills)? In the second half of this session you will learn about age-appropriate games and activities to play with children to help them build these skills. We are now offering training specifically designed to offer Coach training to adults and professionals who work with adolescents, and in particular adolescents who are involved with the juvenile justice system. The brain continues to develop new circuits through 25 years of age, and the circuits developing in adolescence and during the early 20's are those governing planning, complex reasoning, decision-making, and inhibitory control. It is useful for all teens to learn how to strengthen these brain pathways, and this is particularly true for adolescents in the juvenile justice system. Not only do we have coach training custom-designed for this population of adults and professionals, but we are developing new educational materials to teach teens how to strengthen these pathways (coming soon). Executive Training Session: Strategies For Communities To Facilitate Strong Brain Development in Children. A one session training program has been developed to teach community members, business leaders, health care workers, and legislators who want to learn about how the brain develops and what types of activities, programs and interactions best facilitate the development of strong brain pathways in children’s brains for social-emotional skills, language skills, problem-solving skills and conflict resolution skills. This training can be customized for the group receiving it and usually lasts 2-2.5 hours. This training session describes of how brain pathways form during development to support all the skills a child will gain as they grow up and learn. For each skill a child learns (focusing attention, understanding emotions, language skills, problem-solving skills) a network of brain circuits develop that allow them to do the skill well. These pathways form in the brain from birth until about 25 years of age, with each pathway forming at a specific age. People learn new things throughout life, but they don’t develop new brain pathways but use the pathways they have after the period of brain development is complete. In this session we will discuss when various brain pathways develop, and how to help children develop the strongest brain pathways possible. The amazing power of life experiences in shaping brain development, as well as the important role that caring adults and older children interacting with children play, will be discussed. Key aspects of programs that facilitate the development of strong brain pathways to set children on a positive road to succeed in school and in life will be highlighted! Individuals who have taken Working For Kids Coach training and would like to gain the skills to give Working For Kids Coach training sessions themselves in their communities, can take Working For Kids Master Coach training. This training teaches coaches how to run training sessions. Master Coaches receive a customized training manual that will walk them through the training process, access to purchasing materials for the training program, and they will received practice and feedback on running training sessions. All who complete this training program receive a certificate indicating they are a Working For Kids Master Coach. They can then give Working For Kids Coach training programs in their community if they sign an organizational agreement with the University of Pittsburgh and use the Working For Kids Training Materials that are available for sale through our program. Working For Kids Master Coach training sessions are offered in Pittsburgh several times a year as a 2 day session. 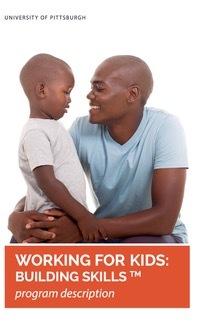 Arrangements can also be made for a Working For Kids trainer to come to location to offer this training by contacting us by email at workingforkids@pitt.edu. Training workshops are designed to allow participants who have taken Working For Kids Master Coach training sessions to use the information they have learned to design programs for use in their own community setting (e.g., parents at home, in-home child care, a preschool, an after school program) to help children build strong brain skills. These are day-long sessions where participants work in groups, using a series of activities to guide them in developing strategies that will work well in their own setting, for helping children stay engaged and have fun learning skills. Skills that can be focused on in workshops include social emotional regulation (i.e., focusing attention, emotion regulation, sharing), language skills (i.e., learning new words, reading, story-telling), and problem-solving skills. Single workshops or a series of workshops can be taken. Contact us to arrange for training programs in your community! Email us at: workingforkids@pitt.edu.